I decided to add this page partly out of wonder that I have yet to be served with a restraining order by Mr. Bamber, but mostly out of gratitude for his bringing Archie to life and admiration for his promising career. There's nothing terribly original here; the fan sites listed in Further Dissertations do a much better job and are far more comprehensive. Also, Jamie's 1999 and 2001 interviews with A&E are both well worth reading. But (hopefully) it's the thought here that counts! * April 3, 1973. Hammersmith, England. JUST HOW MANY NATIONS IS HE A CITIZEN OF?! * Beats me. Born in England, father's American, mother's Irish. Must make tax time interesting. Basically I'm just listing whatever I'm aware of. Jamie has appeared in theater and radio productions as well (among the latter, Richard II -- one of my favorite plays, for which I would gladly sell my next-door neighbor for medical experiments to hear). Once again, your best bets are the fan sites listed in Further Dissertations. Simon Birkenhead (the guy who made the film) used to have a site about it ... but it seems to have disappeared now. from "Joy's Michael Barrymore Pages"
"The rain machines were on and chucking it down, it was bitterly cold, there was lots of noise, lots of pigs and loose women running around, and I couldn't even hear the director shout 'Action!' or anything." Pigs and loose women? The mind boggles. "Dispense with all character, all plot, and stitch together two hours' worth of stuff that would struggle to get into a Vidal Sassoon commercial and pass it off as entertainment. A gross collage of boring set-pieces. I fell asleep. Beautiful girls, though. It's a hit! Put it in a double-bill with Armageddon and you would have just that -- my idea of the end of the world and everything in it." Jamie, I gotta tell ya: I like the way you think. 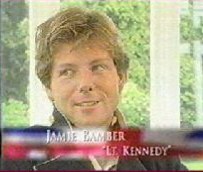 Around the time HH2 was broadcast on A&E, TV Guide posted on their website a little video clip of an interview with Jamie. For a 60-second excerpt, Jamie managed to cover quite a bit of ground, mostly concerning the political and socioeconomic realities of post-Cold War former provinces of the now defunct Soviet Union. (I kid you not.) Alas, the clip is no longer on the TV Guide website, but it may possibly be preserved on one of the Jamie fansites listed on the Further Dissertations page. Following are the two most frequently used addresses for fan mail. However, I feel obliged to note that these are the addresses of Jamie's agents, not his publicists. He does not currently have a publicist and handles his mail himself -- when he has the time. Also, when sending letters to the UK address, including a few international reply coupons would probably save him a heap of expense and difficulty. c/o Shepherd Ford ASsociates Ltd.